The Ring-tailed lemur (lemur catta) is the most recognised lemur due to its long black and white striped tail. 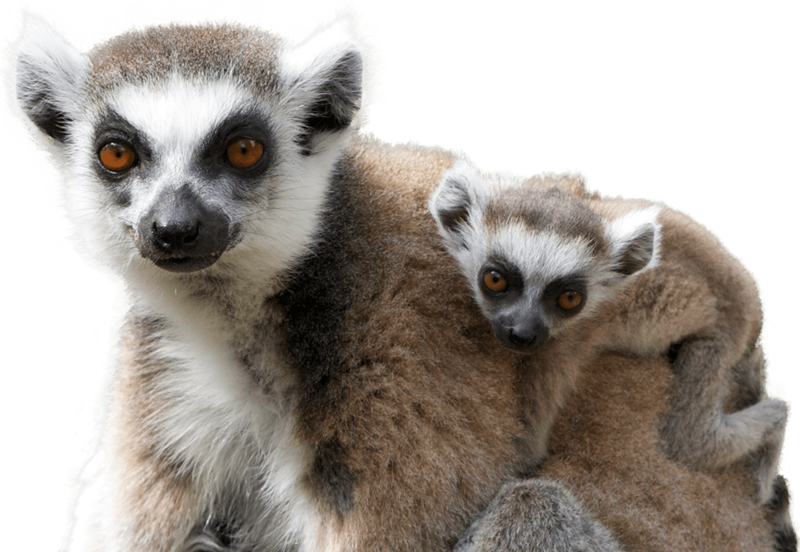 Like other lemurs, they are highly social, living in groups of up to 30 individuals and as with most lemurs, the females are dominant. It is the most terrestrial of lemur species, spending as much as 33% of its time on the ground. They enjoy sun bathing, sitting upright facing its underside, with its thinner white fur, towards the sun. This is often described as a “sun-worshipping” posture or lotus position. Scent-communication is important for ring-tailed lemurs, who use glandular secretions to both advertise status and mark territory. During the breeding season, males compete for access to females using scent as a weapon, engaging in a social display called ‘stink fighting’. Males impregnate their tails with secretions from glands on their wrists, chest and shoulder region, and then wave/waft the scented tail at rival males. The rival will respond in kind until one of them backs down. The zoo is home to 7 ring-tailed lemurs and they are part of a regional breeding program.